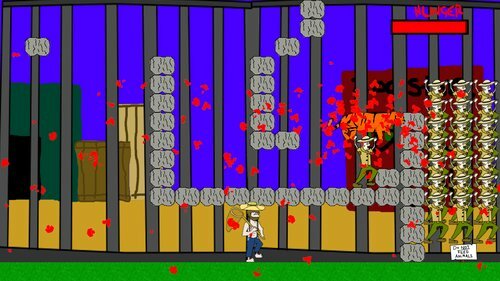 I came across this game when I saw it in a video highlighting a 48 hour game creation competition. This game came in first in the competition and I was interested to know what made it so good. The video did not yield any answers on its own and so I decided to play the game myself and figure it out. I’m glad I did for this game was actually quite fun and its simplistic design doesn’t hold back the gameplay. I shall review this game as I do normal commercial games. Graphics: Most enemies consist of a couple spites, at the minimum they have 2 frames for walking, such as the main tiger protagonist. The graphics are nothing special. The background is unchanging per level and a representation of some of kind of zoo and corresponding kennels. This background looks like it was drawn in Microsoft Paint and took no longer than 5 minutes tops. Still, it sort of fits the style of the game. I wouldn’t have let it go if it were photo-realistic in this cartoon world, so for that reason it is not bad. The part when Graphics start to hurt gameplay occurs when the 3 or so different types of blocks are not varied enough in their appearance that they become confusing. 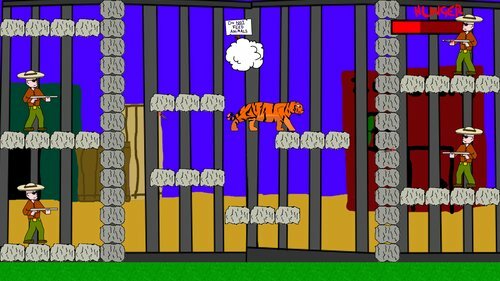 There are cloud blocks, impermeable dark metal blocks, and light metal blocks that allow the tiger’s passage through them. In actuality the impermeable block on is only slightly lighter than the passable varieties. This messed me up in a couple of situations, with I trying to pass through what I mistakenly could not. I would have increased the contrast on the blocks or atleast made a completely different color to lock it on function. Based on the placement of clouds in the game, I assumed that the developers originally thought of having them disappear after the tiger stepped on them, ala Mario games and other plat formers, though they act as normal solid blocks as it is. The best part of the graphics would have to be the guts that fly out of those consumed in the tiger’s hunger. It isn’t so much gory as delightfully humorous to see the red “guts” fly out in all directions; macabre, but light. The game runs in a window, no full screen is available, but I would personally prefer the crisp graphics in a window that stretchy pixels in full screen. The window for gameplay is at a generous resolution as it is. Sounds and music: Simplistic but delightful. The synthesized music in the background doesn’t hurt the ears and I did not find myself hating it even after hearing it repeat itself through the levels of the game. There are cutesy sounds, with an “oh no” male’s voice, and a couple of “wha wha whaaa” as if a minor epic fail had been done at the starving of the tiger. Besides sounds corresponding to win/loss conditions there really aren’t too many other sounds (Besides the once again sadistic yet hilarious chomping sound), which is fine, the game doesn’t need them. Gameplay: What I liked best about this game is that it is very cute and the developers were aware of it, making the game light-hearted, but still focusing on the gameplay aspects. The player must guide his girthy tiger through stages to get to the “Do not feed Animals” Sign. On my first play through I was unsure where I was supposed to go, and what was or wasn’t landscape. For this reason, the sign was probably not the best indication of the level end, but it isn’t too much a problem after grasping what is supposed to be done. Luckily the developers were very wise in allowing the player to play around with the levels. There are no lives and so players have the chance to just try out strategies and get used to new enemies and obstacles that appear. For example, the game doesn’t tell you what you can and cannot eat. While not try and eat everything? Alas, the man with the tiny net is not edible as he captures your “hero” and puts him back working for now wages as an attraction. NO, tigers need to eat. Eat the zoo keeps as they run, and eat the dart men. These dart men’s darts do not harm the tiger as a one hit kill as I originally suspected. Instead they make the tiger slower and unable to jump high for a limited time. Not too bad until the tiger dies from hunger. Like I said, he needs a lot of food to maintain his girth and strength. Why else does he take up a large horizontal space in the world? Due to the one screen nature of the game, probably making it easier to program, there isn’t much opportunity to break away from the basic elements of the game. The tiger needs to avoid the net man, as he slowly followers the player in purely horizontal directions, he must dodge tranquilizer darts, and he must eat men, all in a limited time span. No bosses, no scrolling screens, and a mostly linear game. Despite all this, the game is challenging. Eating people replenishes the hunger bar, and yet it decreases so rapidly, that for the tiger to frolic in the clouds or stop and wait would mean death. There are a couple levels near the end that are very strict in this regard, preventing the player from even missing a bite if he hopes to survive the stage. Another reason to like this game, the difficulty ramps up but without too much penalty for doing so; if you fail, just start the stage again. The game is short and can be beaten in 10 minutes, but in those ten minutes I was more entertained than horrible games that I tried to persuade myself that were good for the hour(s) I spent on them. While there isn’t enough substance in the game to really push it to commercial size, indeed much of its charm comes from its brevity and simplistic mechanics, I think it would have been cool to have a map editor on the side. I know that I’d just fill the screen with food, but still, it increases the lifespan of the game past what the developers might envision. Installation: The game installed easily enough except that it unfortunately required the Microsoft XNA development kit be installed, which I wasn’t pleased about. I had to install that separately requiring more work on my part to get this game up and running. I wish the game could have had what it needed to run packaged in with it besides making me install things on the side. Conclusion: Go play this game. It’ll give you a quick break from work or school (besides the annoying installation). The graphics will not impress you, but the sounds will make you smile, and the music is good. A good show for something made in merely 48 hours.